The Metro tunnels are not an issue for Beverly High only. Just this past week, neighbors of the proposed La Cienega and Wilshire station – touted by Mayor Willie Brien as being “without controversy” – are now learning that their very existence is threatened by the massive excavation planned by Metro at that location. According to Metro, an open trench nearly 2,000 feet or more long and nearly 100 feet wide will take all of Wilshire for up to seven years. Plus, the big dirt haulers 24/7 in and out. How will our signature “Restaurant Row” fare? How will the adjacent medical buildings fare? How will the historic Fox Wilshire – now the Saban Theater – survive? Metro told these people there would be no open ditch, no damage to foundations – that it will all be just fine. That is not true, as they are now learning. •Station boxes and excavations for the Subway Extension will each be about 1,000 feet long by 70 feet wide, not 2,000 feet long and nearly 100 feet wide as wrongly reported by the Courier. •There is certainly a lot of dirt that will have to be hauled from the stations but there is no plan to haul dirt from the station excavations 24/7, as the Courier wrongly reported. •The stations for the existing Red and Purple Lines were not built with trenches that were open for the duration of construction and there is no plan to build stations for the new line with permanently open trenches, as the Courier also wrongly reported. •There will be temporary street closures for the current subway project during initial station excavation. The excavated area will then be covered by concrete decking that will allow traffic to flow on the streets above the station, while construction work continues below ground. When the decking is removed at the end of construction, there will again be temporary street closures. 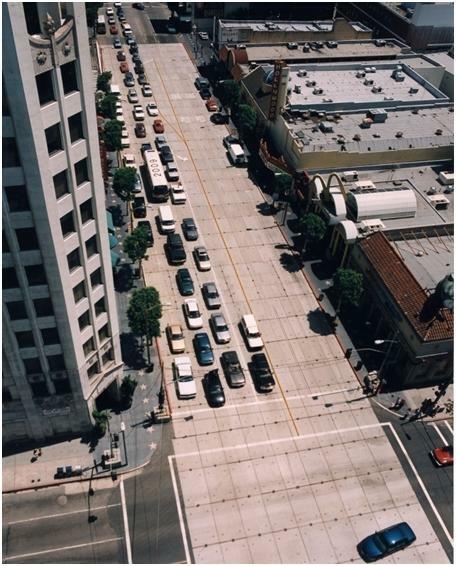 Decking over Hollywood Boulevard at the intersection of Hollywood and Highland during Red Line construction in the 1990s. Photo: Metro. •Street closures, truck haul routes and times, work hours and the like are subject to the approval of the city where there work is located. Construction mitigations will be guided by the Mitigation Monitoring and Reporting Plan that was adopted as a part of the Final Environmental Impact Statement/Report. 23. Will traffic on Wilshire Boulevard and other major streets be disrupted? There is no way to build the subway without some impact to traffic. Traffic impacts will mostly be concentrated at station areas and occur primarily at the beginning and end of station construction. In these areas, detours and temporary lane closures will be required for initial station excavation and to install the temporary street decking. These same measures will be required toward the end of station construction to remove the decking and reconstruct the street. In the approximately five years in between, while the station is being constructed under the decking, impact to surface street traffic will largely be limited to trucks hauling construction materials and excavated soil on designated haul routes. Between stations, tunneling will have little if any impact to surface traffic. Please see our Construction Fact Sheet for more information. Below is the entire fact sheet, complete with drawings that show how station construction work will be done. One wonders if it was an honest error, or deliberate disinformation intended to stir up anti-mass-transit sentiment for some ulterior motive. This is not the first time we’ve had to correct blatant errors in the Courier. As far as I can tell, no one from the Courier tried to contact Metro prior to publishing the story to ask questions about subway construction, etc. I think it is high time Metro re-routes the line to serve San Vicente at the Beverly Center/Cedar-Sinai area, then follow an S-curve to get to Century City, but pass under Wilshire/Rodeo or Wilshire/Beverly and leave room/infrastucture/whatever for a future station for when Beverly Hills wakes up to reality. This will also allow Metro to not tunnel under the precious Beverly Hills High School. such blatant disregard for the facts. sheesh! Beverly Hills is so delicate I mean they already need Wilshire Blvd. to be re paved since its so congested with traffic the street has so many pot holes, especially where the buses run. And as for this subway. It shouldn’t be up to Beverly Hills to decide. Its what good for the entire City of L.A. and not whats good for themselves. Glad the Courier stepped away from its coverage of the latest debutante’s ball to run a completely inaccurate story in order to stoke the fires of class hatred and false entitlement. Could this be libel? Beverly HIlls is obviously anti-mass transit and the article could have been written with malice. Libel per quod is my guess. I agree with Eric listed above. Why did the paper contact Metro instead of printing misinformation. At some point I hope Beverly Hills changes their mind and realizes that the subway is good for the entire LA Area. Good job catching this,and setting things straight. The Courier’s been spreading dishonest hysteria for a while now. I’m sorry you have to respond to more of this nonsense. I don’t know why some people feel the need to make stuff up in order to attack a project which will benefit everyone. Why are we not surprised? The Courier publishing yet even more misinformation and clear lies? Wake me up when the citizens of Beverly Hills actually stand up to this hysteria (will someone PLEASE “think of the children!!! !”) and actually let RATIONAL MINDS (not to mention pure FACTS) PREVAIL!!!! The whole world (with their darn subways running under all kinds of “sensitive” places, including hospitals, pre-schools, etc etc) is laughing at us while we play into their well-funded scheme. My fellow Beverly Hills citizens should be ashamed for letting it go on for so long.